California’s salmon hatchery programs badly need major projects and upgrades. The future of wild and hatchery salmon runs, as well as commercial and sport fisheries in California, depends on these programs. However, hatchery programs are operated and funded under antiquated water project mitigation programs that lack a progressive approach (and funding) for hatcheries in salmon ecosystems in California. And neither the Sacramento Valley Salmon Recovery Program (SVSRP) nor Proposition 3 includes investments in hatcheries. Serious loss and degradation of habitat limits natural production of salmon and steelhead in California. Hatchery program goals have been consistently expressed in terms of juvenile production rather than adult production. Program purposes have not been clearly defined. Hatchery monitoring and evaluation programs and Hatchery Coordination Teams are needed. Program size has been set independent of any consideration of potential impacts of hatchery fish on affected natural populations. Off-site releases promote unacceptable levels of straying among populations. Marking/tagging programs are needed for real-time identification of all hatchery-origin Chinook salmon returning to hatchery facilities. Standards for fish culture, fish health management and associated reporting are inadequate and need to be improved. Populations and population boundaries have not been established for non-listed species and are needed for effective development of integrated hatchery programs. Harvest management of Sacramento River Fall Chinook should account for the productivity of naturally-spawning adults. Because scientific studies have shown that hatcheries reduce the long-term fitness and survival of salmon species, and California’s listed salmon and steelhead cannot be sustained without hatcheries, it is imperative that hatchery programs be upgraded to safeguard the future of salmon in California. One way to accomplish this goal and the others described above is to adopt the goals and objectives of a Conservation Hatchery Strategy. First, there needs to be a shift away from hatcheries as mitigation for long-ago-built dams and water diversions, and a shift toward hatcheries contributing directly to salmon recovery and conservation. Dumping tens of million salmon and steelhead hatchery smolts at the eight hatcheries or trucking some to the Bay may sustain a minimal coastal fishery, but it will not bring recovery or delisting of endangered populations. Conservation hatcheries are a necessary tool for salmon recovery. The eight hatchery programs need funding to convert them to conservation hatcheries. That funding could come from the SVSRP and resource agency programs, and future ballot initiatives, as well as mitigation programs. At a minimum, the SVSRP should be integrated into an ecosystem-based management approach that includes conservation hatcheries. 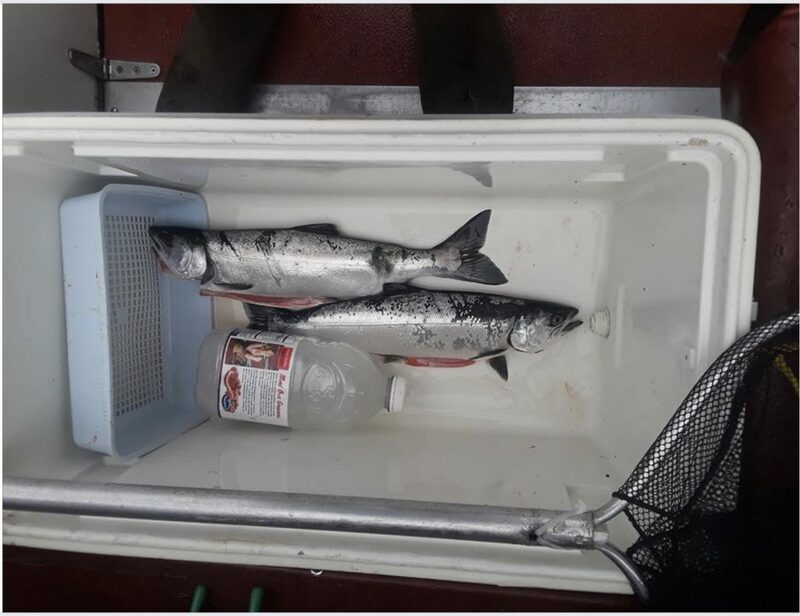 The two sub-adult hatchery coho pictured above were recently caught in Puget Sound near Seattle, in a mark-selective fishery (note adipose fins missing on all hatchery coho as in California) where all wild fish (intact adipose fin) must be released. This Washington state sport fishery is hugely popular.1 These hatchery fish reside in the Puget Sound year-round, unlike their wild counterparts. Coho are native to the California coast and are listed under the state and federal endangered species acts, as they are in Oregon and Washington states. Coastal coho are supplemented by four hatcheries in California. No coho may be kept in California fisheries. Coho were once planted in California reservoirs and supported popular fisheries. Recovery Strategy GOAL VI: Reach and maintain coho salmon population levels to allow for the resumption of Tribal, recreational, and commercial fisheries for coho salmon in California. So why not establish mark-selective fisheries for coho in coastal bays in California (e.g., Monterey, San Francisco, Tomales, and Humboldt bays)? The same issues and conflicts in California occur in the Puget Sound fishery. Why not help the underfunded California Coho Recovery Program with revenue generated from such a hatchery coho fishery? For more information on coho recovery, see: http://www.westcoast.fisheries.noaa.gov/. Research has often shown that hatchery salmon perform less well than their wild counterparts. The reason for this has often been attributed to genetic factors such as parent selection or to the lack of opportunity for Mother Nature to cull misfits. Recent research indicates that poor performance of hatchery fish may stem more from the their environmental experiences than from their genetics. Some older theories that suggested that hatchery fish were just raised dumb now have gained a new following. New research from Canada suggests that atypical food and feeding combined with overcrowding in hatcheries weakens inherent genetic abilities to cope with the natural environment. In California’s Central Valley, we have added the burden of releasing hatchery smolts late in the natural emigration season outside of peak flow periods, into warmer waters that are full of other fish that want to eat them. When the salmon from the hatcheries get hungry, there is no flood of fresh food pellets. Their new environment results in starvation, thermal stress, and much higher vulnerability to predation. Still, hatchery fish make up 70-90% of California’s salmon runs, because Valley habitats no longer support historic levels of wild salmon production. In recent posts, I have advocated raising hatchery fry in Valley floodplain habitats. UC Davis studies have shown high rates of growth of hatchery fry raised in flooded rice fields during the winter. New planning efforts call for more flooded Valley habitats, including rice fields, but these efforts focus primarily on wild juvenile salmon. There has been no testing to date of the performance of hatchery fry that rear under controlled floodplain conditions. In light of the recent Canadian research, the ability of floodplain-reared hatchery fish to survive, and the degree to which they stray, warrant evaluation. Last week, the annual arrival of cedar waxwings hit my back yard near Sacramento. Each January, these magnificent birds fill my small back yard by the hundreds to feast for several days on the fermented fruit of three tall grape trees. The birds eat nearly every grape, likely a ton of fruit hanging from the branches. In several days the birds are gone, not to return for another year. I often wonder how important my little backyard piece of habitat is for this population of Cedar Waxwings, and how much of their winter energy comes from this small crop of fruit. The birds remind me of another annual backyard run, the Cook Inlet Coho and Chinook salmon near Anchorage, Alaska, where I lived for three years in the mid-1980s. A large run of Coho showed up right on time each year at the end of summer in a creek that was literally in my back yard. Only kids were allowed to fish the city’s creeks for salmon, so I taught the neighborhood’s boys, including my 12-year-old son, how to catch and release the Coho. For a week or two, they could catch five or so bright ten-pounders in an hour or two a day. Me, I canoed down a tidal creek on the Kenai Peninsula side of the inlet and camp for a weekend to fish the fresh Coho run entering from the Inlet. I built a blind right on the creek within sight of the inlet. I could see the white backs of dozens of Beluga whales herding and feeding on the incoming salmon just a few dozen yards off the creek mouth. At night, the Coho approached the light of my Coleman lantern, even allowing a brief pet or two on my part, while maintaining steady and wary eye contact. In the spring (late May), I often hitched a plane ride across the inlet (10 minutes and $40) to fish the spring Chinook run for a weekend of 24-hour daylight. At low tide, the small rivers were over 30-ft below the tule-lined channel. At high tide, the channel filled to the tules, along with seemingly bank-to-bank 30-lb spring-run salmon that obligingly hit any lure I put in front of them. This annual rush of spring Chinook lasted for a week or two before the fish moved upstream to await their late summer spawn. A recent post on the KCET website by Alastair Bland spoke of efforts to save salmon on the Klamath River. I add my perspective in this post. I have been involved in the Klamath salmon restoration on and off for nearly 30 years. In my experience, the runs of salmon and steelhead keep declining because not enough gets done and because there is lack of progressive management. 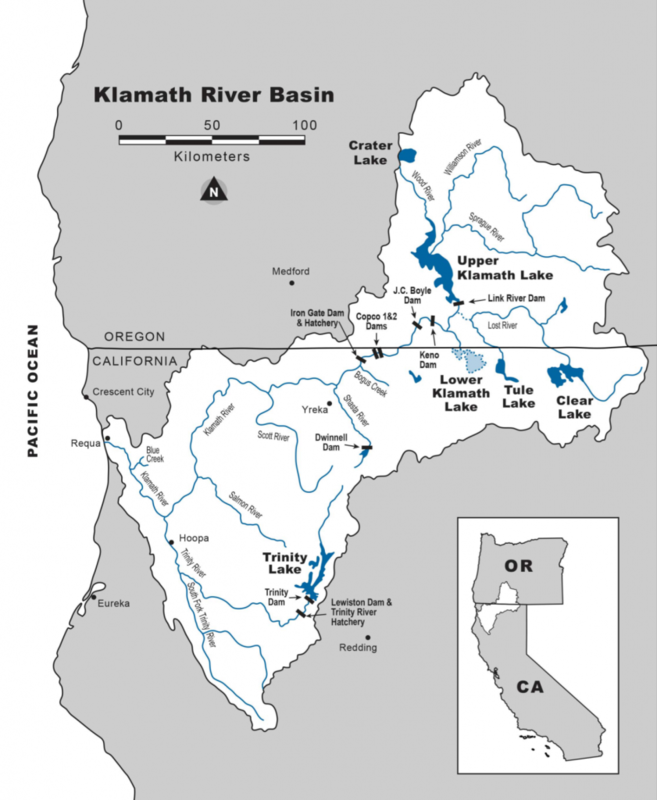 The Klamath is a big watershed (Figure 1). I tried to sit in the middle of one element of the process a few years ago on the Scott and Shasta Rivers, the Klamath’s two main upstream salmon tributaries below Iron Gate Dam. I found there were not just two sides involved in conflict, but really five: tribes, government agencies, ranchers-landowners, a power company, and environmentalists. There were even sides within sides. The four tribes often did not agree or work together. The four fish agencies often could not agree. The two states did not always agree, and individual state agencies disagree, resulting in conflicting water rights, water use, and water quality regulations. Counties and cities disagree. Neighboring Resource Conservation Districts differ in approaches. Many citizens want a new state carved from the two states. Some landowners love salmon and beavers, and others do not. Then there are the big watershed owners: private timber companies, US Forest Service, and Bureau of Land Management that manage forest watersheds differently under a wide variety of regulations and approaches that often do not protect salmon. I watched county sheriffs try to lead landowners in policy and enforcement, with a willingness to enforce vague trespassing rules on rivers and creeks. I watched as State Water Resources Control Board members toured watersheds and met with tribes and local leaders in an effort to resolve conflicts in over-appropriated watersheds. I watched as CDFW staff tried to enforce stream channel degradation and water diversion regulations on private and public lands. While some progress gets made, it is too slow to save the native fish. Coho and spring-run Chinook are hanging on but slowly going extinct. Fall-run Chinook are supported by hatcheries but still declining. The iconic Klamath and Trinity Steelhead are silently and slowly fading away. For decades, the various sides have waged war over water, dams, and property rights. The watersheds and fish have suffered as “Rome” burned. Some folks have worked hard to save what is left (e.g., Blue Creek watershed). Over the decades many battles have been waged and much compromised. Lawsuits abound. Commercial and sport fishing get constrained more and more each year. Fewer California residents make the trip north to fish the Klamath each year. There remain many intractable problems that may never be resolved. The upper watershed in Oregon, mainly around Klamath Lake and the Sprague River, suffers greatly from agricultural development and attendant water quality issues that are unlikely to go away. Much watershed damage has already occurred from timber cutting, urban and agricultural development, roads, fires, and floods. 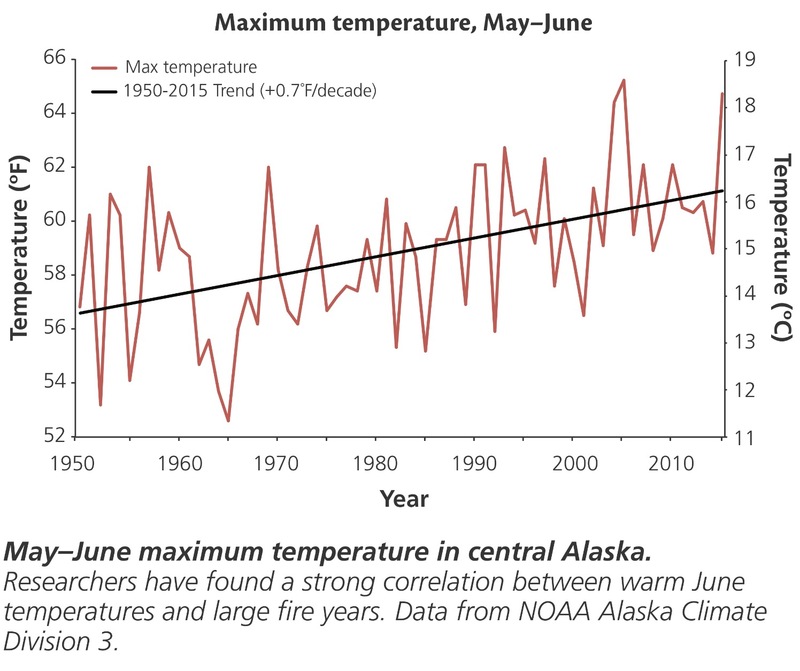 Global warming will continue to reduce rainfall and essential over-summer snowpack throughout the Klamath watershed. Despite the grim outlook, I have found there are a host of potential actions that can help even before we get to the long-awaited four-dam removal. We need to stop the bleeding, save the patient, and start recovery. Many of the treatments and tools are already available. Some are willingly provided by Mother Nature (e.g., water and beavers). There are many diverse efforts and treatments already underway on a small scale that can be expanded and coordinated. Lessons learned can be better shared. 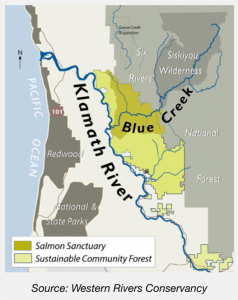 Move toward making the Klamath tributaries, the Salmon, Scott, and Shasta rivers, salmon sanctuaries like Blue Creek on the lower Klamath, an effort being coordinated by the Yurok Tribe. Allow the Karuk Tribe to coordinate on the Salmon River (give them a grant to do this). On the Scott and Shasta Rivers, allow ranchers to coordinate. The Nature Conservancy is already involved in the Shasta River, as Western Rivers Conservancy is in the Blue Creek Sanctuary. Re-adjudicate water rights and water quality standards on the Scott and Shasta rivers. I know these are “fighting words”, but it must be done now. At least start this process, starting with the State’s new groundwater regulations. Vital portions of both rivers sit dry much of the year from surface diversions and groundwater extraction. Hundreds of thousands of young salmon and steelhead literally dry up every spring and summer, including tens of thousands of endangered Coho salmon. State laws prohibit this, as do State Board regulations, yet it continues on a large scale. Make the State enforce the laws. List Klamath spring-run Chinook as a federal and state endangered fish. They have become extinct from the Scott and Shasta rivers in my lifetime. They hold on in the Salmon River. They need and deserve full protection of the state and federal endangered species acts. Fully implement federal and state recovery plans for salmon and steelhead. Get funding. Re-introduce Coho and spring-run Chinook salmon to tributaries where populations are or are near extinction, including tributaries above dams. Rehabilitate hatchery programs on the Klamath and Trinity rivers. Develop conservation hatchery elements within these existing programs to promote wild genetic strains of salmon and steelhead in the tributaries. Reconnect the upper Shasta River to allow salmon and steelhead access. This process was started by the Nature Conservancy and tribes, but is long delayed and unfunded. Fully fund and implement a salmon and steelhead rescue program for young stranded in tributary spawning rivers. 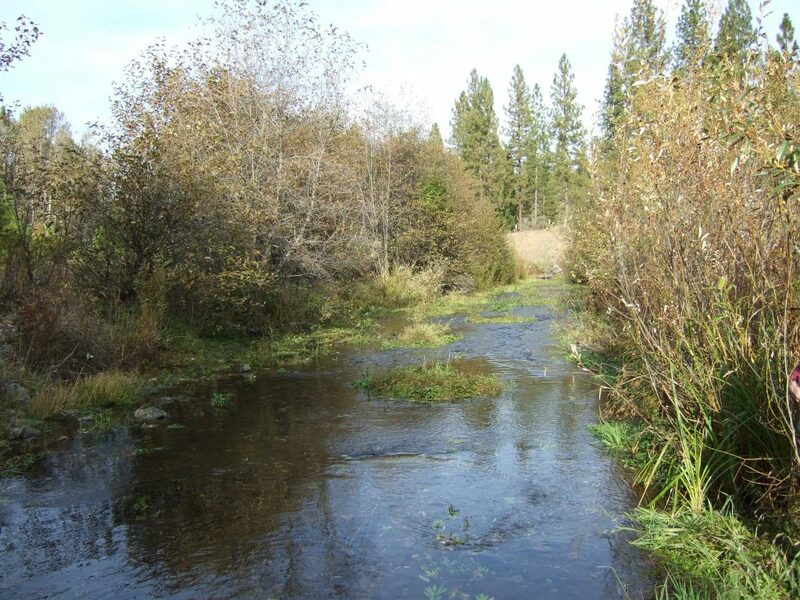 Improve access of spawning salmon and steelhead to historic spawning grounds blocked or hindered by irrigation dams, road crossings, or low streamflow. Ensure the ongoing development of the Klamath-Trinity Coho Salmon Biological Opinion for operation of the Shasta-Trinity Division of the federal Central Valley Project adequately protects and helps restore the endangered Coho salmon. Require the California Resources Agency to take a leadership role in making the Klamath a priority.